Can you talk a little bit about how this movie came to be? I read that footage for this film was shot over 20 years. In the 1980s, I was living in Atlanta and working for Turner Broadcasting, making independent films. We did a big film on Ralph McGill, and it was actually while we were interviewing [Lewis] for the McGill film that I first heard his story. It was clear right away that someone should be making a film about this guy. We shot maybe 20 hours of tape in the 1990s, and then the film basically sat in my closet for about 15 years. Then around 2010, after President Obama had been in office for a while, people started asking about it. I thought, “Well if it’s ever going to get made, it would be now,” because Obama’s first presidential campaign had put the spotlight on a lot of civil rights leaders. I brought some tape of what I had shot in the 1990s to Lewis’s office, and I asked him, “Should we finish it?” He agreed. There was about 150 hours of tape, which we edited into a film-length documentary. 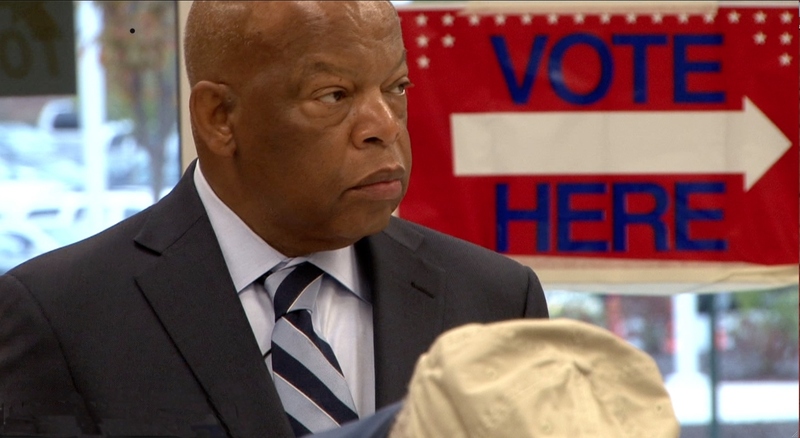 Congressman John Lewis at his polling station in Atlanta. Is there a particular scene or interview that stands out to you? There’s a whole section that we shot early on of his family in Pike County, Alabama—a big family reunion. It was amazing to get a truer sense of where he comes from and how integral that is to who he is. You can read all you want about the Black Belt in Alabama, but when you go there, especially back then in the early 1990s, you get a glimmer of what the hardship of growing up in a place like that would be. I think a lot of people meet him and hear his stories and just can’t figure out how this guy can be so authentic, have this spirit of optimism and commitment to nonviolence. The challenge to a filmmaker is to be able to show that, and when I started this film, I had no idea how I ever would. I felt like in that scene with his family, you could begin to understand that essence in him and where it came from. This was the start of his road, and if you look at the extraordinary path he has traveled since then, it’s built on the foundation of this place. The film doesn’t cover Lewis’s recent criticism of Donald Trump or the President’s counter-attack on Lewis. Were you surprised by the events? 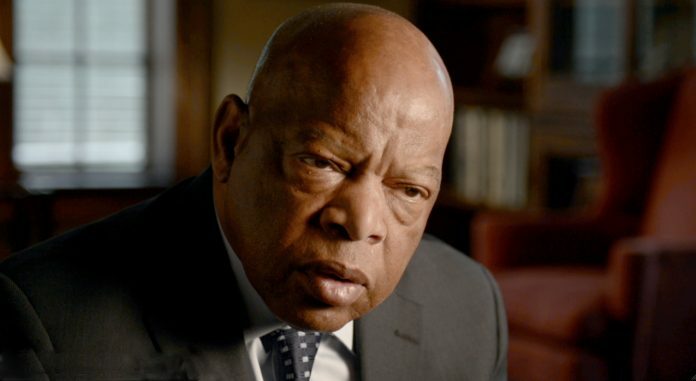 John Lewis is an unusual member of Congress. He is someone who is referred to as the conscience of Congress, someone who speaks his mind and speaks it very plainly and straightforwardly. To hear him say [what he said] about Trump, it was not an unusual thing. It was the timing and the essence of it that brought international attention. For those of us who follow him, though, the words were not surprising. Can you talk a bit about the title, Get in the Way? That’s one of the Congressman’s favorite phrases and one of his real identifiers: Make some noise, get in the way. It refers to, I believe, the need for all of us to respond to injustice in our world and in our society. It means that it’s up to us—those of us who are in positions to do so—to stand up and to speak out, make some noise, and not allow those injustices to continue. 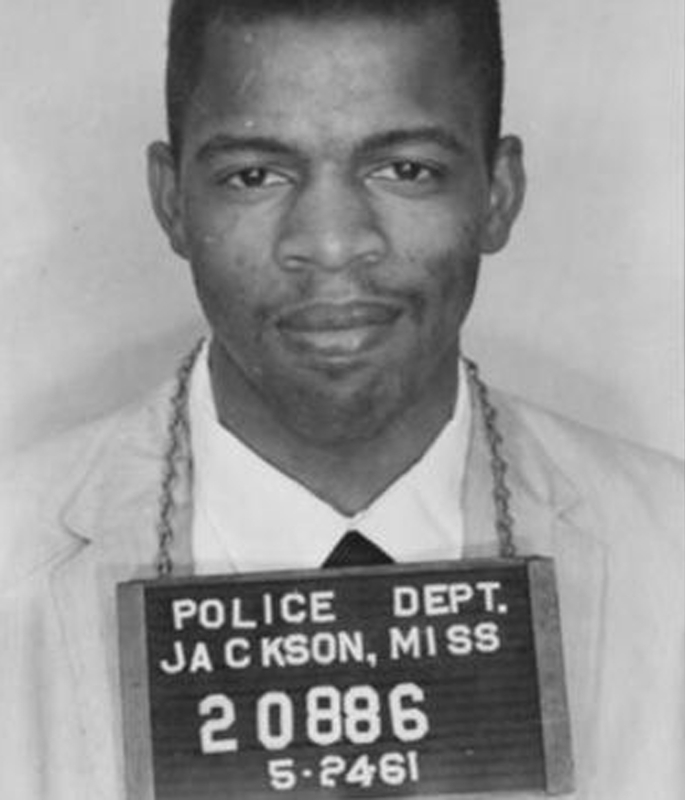 during the 1961 Freedom Rides. What do you hope viewers—especially those who aren’t already familiar with Lewis’s story—take away from this documentary? In screenings so far, people have just been enormously inspired. And that’s something I had hoped for. Some people want to go out and start voter registration drives, other people want to go volunteer at the soup kitchen. Lewis is a master at connecting people and giving them a sense of purpose in their lives. And I hope that seeing the film, even for people who already have a sense of purpose, it kind of reignites them. I would be very proud to be associated with a film that has that effect. As for the Congressman, he was most eager to support this film because he wants what he learned and what he went through in the [civil rights] movement to be of use to future generations. And as we were putting the film together, we kept that in mind. It is meant to be a useful tool as well as a piece of entertainment. There are so many things that John Lewis’s generation, Dr. Martin Luther King Jr.’s generation went through in a really concentrated period of time. It was an extraordinary period in history for so many reasons, and they carry those experiences with them. It was our job to take that and put it together into film.